For the last three years, Montanans Against Assisted Suicide (MAAS) has been an integral player in keeping assisted suicide from becoming legal in Montana. Most recently, MAAS has been prosecuting a lawsuit against the Montana Board of Medical Examiners. The suit has already caused the Board to remove a position statement implying that assisted suicide "may" be legal in Montana. [The] position paper - in response to the lawsuit - has since been rescinded by the Board and scrubbed from its website. But [MAAS's attorney, Margaret] Dore said court action was still needed to prevent the Board from reinstating such a position. Sanjay Talwani, "Montana judge hears assisted suicide arguments," MTN News, December 11, 2013. Problems with legal assisted suicide include that it encourages people with years to live, to throw away their lives. Legalization also creates new opportunities for elder abuse, for example, when there is an inheritance involved. In Oregon, legalization has enabled Oregon's Medicaid program to offer the "treatment" of suicide in lieu of desired treatments (to improve the quality of life, to extend life or to cure). MAAS's attorney, Margaret Dore, who is also President of Choice is an Illusion, is donating her time. Choice is an Illusion has also provided financial support for the MAAS lawsuit. Ongoing funds are, however, needed to pay for the rest of MAAS's legal team including the Charlton Law Firm and for out of pocket expenses such as transcripts, computer research and court fees. We are asking for your support as your finances allow. Any amount is appreciated. Please donate online by clicking here or here. Welcome to our newest Board member, Kate Kelly! Kate Kelly grew up in Halifax Nova Scotia, Canada. She is the daughter of self-educated working-class parents, who instilled in her a love of books, music, nature, old movies, and compassion for "the average Joe" and all vulnerable creatures. Kate dropped out of high-school, becoming well-acquainted with minimum-wage jobs. She eventually attended university as a mature student, graduating with a B.Ed. in English and a B.A. in Drama. 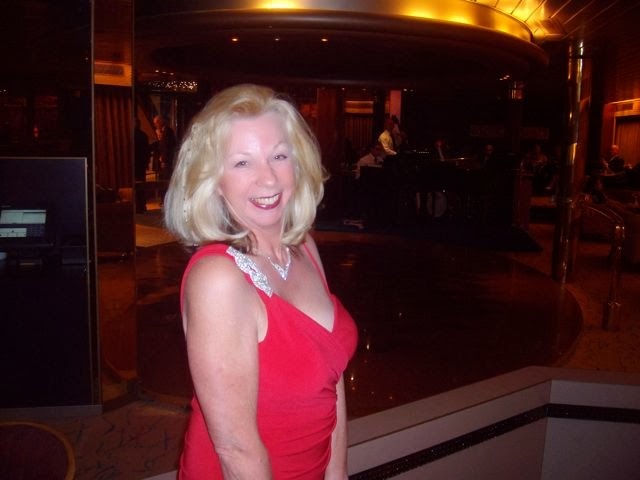 Kate has been a travel agent, salesclerk, child care worker, actress, cab driver, art model, gas jockey, reporter, cleaning woman, teacher, jazz singer and office clerk. She has lived and worked in 6 Canadian provinces and 1 territory, and travels extensively. Kate is passionate about seniors' rights, rescuing dogs, and singing. She hopes to live to at least 100, and die without being "pushed along." Kate's publications include "Mild Stroke Led to Mother's Forced Starvation." Below is an updated biography for Choice is an Illusion Board Member, William Reichel MD. As noted below, he was recently named as one of five Pioneers in Geriatric Medicine. Thank you for your work Dr. Reichel! William Reichel, M.D. is Vice President and a Board member of Choice is an Illusion. He is also an Affiliated Scholar with the Center for Clinical Bioethics, Georgetown University School of Medicine. Dr. Reichel received his M.D. from Columbia University College of Physicians and Surgeons in 1961. His residency in Internal Medicine was at Stanford Medical Center. He provided leadership in Geriatrics, serving 13 years on the Board of Directors of the American Geriatrics Society, including serving as its President. He was recently named as one of five Pioneers in Geriatric Medicine. The 6th Edition of a Cambridge University Press text, "Reichel's Care of the Elderly: Clinical Aspects of Aging," was released in February 2009, and the 7th Edition is in preparation. In his practice, Dr. Reichel saw the many ethical dilemmas that occur in patient care. He thus pursued a study of ethics, at first at Georgetown in 1984, and then as a Visiting Scholar in Medical Ethics at Harvard Divinity School, 1988-1990. At Harvard Divinity School, he concentrated on euthanasia, both in Germany before and during World War II, and in the Netherlands, publishing on assisted suicide and euthanasia. In 1998, Dr. Reichel was appointed to the Center for Clinical Bioethics at Georgetown where he continued his scholarly work that included the study of assisted suicide and euthanasia. Now retired from practice, Dr. Reichel continues as an Affiliated Scholar at the Center for Clinical Bioethics and he continues to participate in the public debate against legalization of assisted suicide and euthanasia. His commentaries in letters to the editor have been published throughout the United States, in Canada, the UK and New Zealand. For example, click here. Originally published in The Advocate, the Official Publication of the Idaho State Bar, October 2010. In the Netherlands, Dutch law calls for performing euthanasia and assisted suicide with the patient's consent. This is not, however, always done. Indeed, over time, assisted-suicide on a strictly voluntary basis evolved into allowing euthanasia on an involuntary basis. Euthanasia is also performed on infants and children, who are not capable of giving consent. 2005 is the most recent year for which we have an official report from the Dutch government. The report is "spun" to defend its law, but nonetheless concedes that 550 patients (an average of 1.5 per day) were actively killed by Dutch doctors "without an explicit request." The report also concedes that an additional 20% of deaths were not reported to the authorities as required by Dutch law. [Proponents of assisted suicide and euthanasia] hold . . . out the carrot of "choice" to induce the public into believing that [these practices] are somehow benign. Do not be misled. This Canadian article is consistent with the Oregon experience in which legalization of physician-assisted suicide was followed by a significant increase in other suicides. See footnote 1. Retired politician Bob Rae used the occasion of a friend's apparent suicide to call on Canada to establish a national suicide prevention plan. Chris Peloso was Rae's friend and well known in Ontario's political circles as the husband to George Smitherman, a former high-profile cabinet minister and politician. Media reports haven't utilized the term suicide, but the phrase "lost his battle with depression" seems to indicate that was the case. Calls for such a strategy are made every time there is a high-profile suicide in this country (such as Amanda Todd and Rehtaeh Parsons, two girls who suffered unbearable bullying in school and on the Internet). Parliament passed a suicide prevention strategy one year ago, but few seem to be aware of its existence or its implementation, and society continues to call for somebody to do something to prevent such tragedies from occurring. Prevention is usually a good policy. But I have questions about whether any suicide prevention policy can be successful with Canada's health-care system and be consistent with other societal messages. The first question is how can we effectively prevent suicides by those who are depressed when our health-care system offers limited (at best) access to psychiatric care and treatment? A depressed person can call a suicide hotline or speak with a counsellor, and a crisis may be prevented. Or maybe not. But, at some point, the only way to prevent suicide is to access medical treatment. The Fraser Institute's 2013 report, Waiting Your Turn: Wait Times for Health Care in Canada, reveals that the national average wait time from referral by a general practitioner to the time of beginning non-urgent psychiatric treatment was 20.3 weeks. If you live in New Brunswick, that wait is 73.5 weeks. That's about 1.5 years to access treatment and includes a 46-week wait from the time of GP referral to seeing a psychiatric specialist. If you live in Saskatchewan, the wait for treatment is one year. Even if the case is urgent, patients still face a five-week wait to get an appointment with a psychiatrist. Anyone familiar with depression or other mental illnesses knows that a lot can change in five weeks, let alone one year. Rae thinks it's important to have public conversations about mental illness. But awareness has absolutely nothing to do with treatment and, based on the above statistics, it's difficult to imagine that any province could maintain an effective suicide prevention strategy. My second question raises an issue that Canadians may not be familiar with, but will undoubtedly face in the coming months as Quebec (and eventually the rest of Canada) debates the legalization of euthanasia. That is, how can we credibly promote suicide prevention strategies at the same time as a large portion of society is publicly claiming they have a right to die? After all, euthanasia is supposedly about the right to self-determination when individuals are forced to live in circumstances that are unbearable. At least that's how the conversation goes. The reality of legalization is very different, as we've seen in Belgium, the Netherlands, Switzerland and Oregon. Each of these has relaxed their laws to the point that depressed people can easily access euthanasia. As one bioethicist claims, euthanasia in these districts expands the options for the mentally ill and "empowers" them when they make the choice. A 2005 study in the Journal of Clinical Oncology showed that almost one half (44 per cent) of requests for euthanasia were made by patients with depression. These authors started with the premise that terminally ill people who requested euthanasia were more accepting of death and that depression would therefore not be a factor. In contrast, they found that depressed patients were four times more likely to request death. A report in Current Oncology in 2011 summarized euthanasia in the Netherlands by saying that in 30 years, it "has moved from euthanasia of people who are terminally ill, to euthanasia of those who are chronically ill; from euthanasia for physical illness, to euthanasia for mental illness; from euthanasia for mental illness, to euthanasia for psychological distress of mental suffering," and now to euthanasia of those over 70 who are simply "tired of living." How do we talk about such facts while promoting a national suicide prevention policy? A society that knows the slippery slope of euthanasia and still accepts its legalization has no credibility in talking about suicide prevention for those with mental illness. Susan Martinuk is a columnist based in Western Canada. Her column appears every Friday. Oregon’s suicide rate, which excludes suicide under Oregon’s physician-assisted suicide act, is 35% higher than the national average. This rate has been "increasing significantly since 2000." Just three years prior, Oregon legalized physician-assisted suicide. This increased suicide rate is consistent with a suicide contagion (legalizing one type of suicide encourag[ing] other suicides). There is, regardless, a statistical correlation between these two events. Originally published as "'Death with Dignity': What Do We Advise Our Clients?," King County Bar Bulletin, May 2009. See here. A client wants to know about the new Death with Dignity Act, which legalizes physician-assisted suicide in Washington.1 Do you take the politically correct path and agree that it's the best thing since sliced bread? Or do you do your job as a lawyer and tell him that the Act has problems and that he may want to take steps to protect himself? The new act was passed by the voters as Initiative 1000 and has now been codified as Chapter 70.245 RCW. During the election, proponents touted it as providing "choice" for end-of-life decisions. A glossy brochure declared, "Only the patient — and no one else — may administer the [lethal dose]. "2 The Act, however, does not say this — anywhere. The Act also contains coercive provisions. For example, it allows an heir who will benefit from the patient's death to help the patient sign up for the lethal dose. The Act requires an application process to obtain the lethal dose, which includes a written request form with two required witnesses.3 The Act allows one of these witnesses to be the patient's heir.4 The Act also allows someone else to talk for the patient during the lethal-dose request process, for example, the patient's heir.5 This does not promote patient choice; it invites coercion. Once the lethal dose is issued by the pharmacy, there is no oversight. The death is not required to be witnessed by disinterested persons. Indeed, no one is required to be present. The Act does not state that "only" the patient may administer the lethal dose; it provides that the patient "self-administer" the dose. In other words, someone else putting the lethal dose in the patient's mouth qualifies as "self-administration." Someone else putting the lethal dose in a feeding tube or IV nutrition bag also would qualify. "Self-administer" means that someone else can administer the lethal dose to the patient. If, for the purpose of argument, "self-administer" means that only the patient can administer the lethal dose himself, the patient still is vulnerable to the actions of other people, due to the lack of required witnesses at the death. With no witnesses present, someone else can administer the lethal dose without the patient's consent. Indeed, someone could use an alternate method, such as suffocation. Even if the patient struggled, who would know? The lethal dose request would provide an alibi. This situation is especially significant for patients with money. A California case states, "Financial reasons [are] an all too common motivation for killing someone. "8 Without disinterested witnesses, the patient's control over the "time, place and manner" of his death, is not guaranteed. If one of your clients is considering a "Death with Dignity" decision, it is prudent to be sure that they are aware of the Act's gaps. By signing the form, the client is taking an official position that if he dies suddenly, no questions should be asked. The client will be unprotected against others in the event he changes his mind after the lethal prescription is filled and decides that he wants to live. This would seem especially important for clients with money. There is, regardless, a loss of control. Since the day [the patient] was given two to four months to live, [she] has gone with her children on a series of vacations . . . .
As lawyers, we often advise our clients of worst-case scenarios. This is our obligation regardless of whether it is politically correct to do so. The Death with Dignity Act is not necessarily about dignity or choice. It also can enable people to pressure others to an early death or even cause it. The Act also may encourage patients with years to live to give up hope. We should advise our clients accordingly. Margaret Dore is a Seattle attorney admitted to practice in 1986. She is the immediate past chair of the Elder Law Committee of the ABA Family Law Section. She is a former chair of what is now the King County Bar Association Guardianship and Elder Law Section. 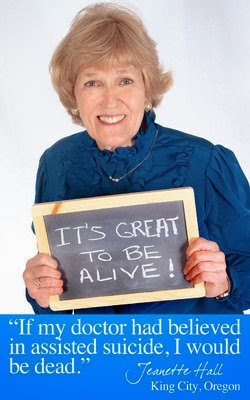 For more information, visit her website at www.margaretdore.com. 2 I-1000 color pamphlet, "Paid for by Yes! on 1000." 5 RCW 70.245.010(3) allows someone else to talk for the patient during the lethal-dose request process; for example, there is no prohibition against this person being the patient's heir or other person who will benefit from the patient's death. The only requirement is that the person doing the talking be "familiar with the patient's manner of communicating." 8 People v. Stuart, 67 Cal. Rptr. 3rd 129, 143 (2007). 9 RCW 70.245.010(11) & (13).